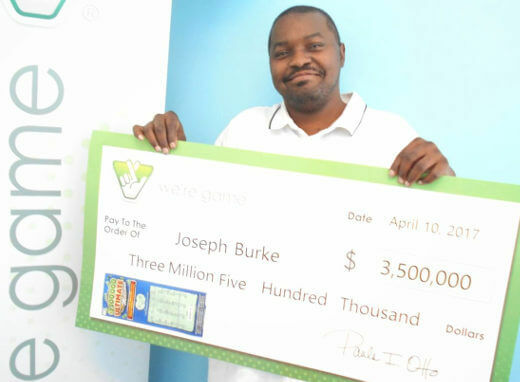 Burke took advantage of his lunch break to buy two “$3,500,000 Ultimate Millions” tickets from the BP One at 3711 Holland Road. As there was still time, he scratched off the tickets right then and there. He was disappointed with the first ticket but the second one landed the top prize. He said all that he saw were a lot of zeroes and was so stunned he just walked off without telling anyone. He took the one-time payment option to take home slightly less than 2 million dollars. Amy James, on the other hand, favored the “$4 Million Mega Multiplier” scratch off game. She bought one of the tickets from the Food Lion in Williamsburg and, like Burke, scratched it off at the store. She could hardly believe it when she bagged the top prize. But she was calm enough to stash the ticket in her purse and finish her shopping. She later opted for a single payment of $2.15 million net of taxes. She says she plans to invest her winnings.